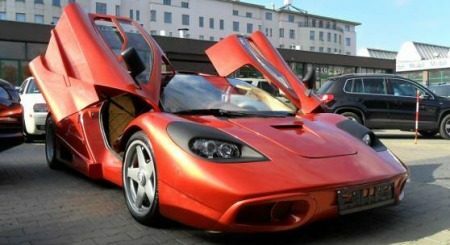 I know some guy out in Poland did a heck of a job at building a Replica Mclaren F1 all the way down to the 3 seat design. What about here in the states? How would someone go about building one of these? I know for a fact its going to cost six figures to build and then design a tube chassis. I've been planning for the future for sometime now and after I build my dream car(The Lamborghini) I've always wanted to own two exotics. Originally I had plans on doing a Countach and a Testarossa but now times changed and id still rather do a Countach but the TR has become a vairable for me and I'm more opened to building something else like a Zonda or Mclaren F1. I really wanna do a Mclaren F1 though. If not I don't mind settling for a Zonda Replica or something else thats Super exotic. I figure id better start planning now. Last edited by FunnyWheels; 01-27-2012 at 09:10 PM. Originally I too had plans on doing a Countach but tons have been done and there are some basic flaws in the original and replicas.. so I decided to customize, improve and update it to a one off prototype using readily available molds, panels and parts. Call it King Countach kind like Shelby's mustangs = king snake = super snake - etc etc. Mclaren F1 though is different in that you need to decide to make plugs, molds, panels and copy chassis, etc. adding to the build expense but giving means of making more of them. Or re-skin and customize a donor vehicle that most closely mimics the Mclaren F1 but only gives you a one of. However you give up some degree of exactness in your reproduction. If you need exact buy a real countach (affordable these days) and continue to dream about the Mclaren F1. I thought of getting the zonda body; making the car super light weight; putting in a suzuki 1300 engine(with some extras); and be done. It wouldnt be good to do an f1 replica now that mclaren has its new supercars out so they will he heating the handle on replicas. I'm doing a Lamborghini regardless of what else is out there. Zonda, Veyron, Mclaren F1, Vector W8. I was thinking about the Mclaren for the future cause I'm thinking to myself what if I do end up getting married having a baby? I'm not buying some lame 4 seater sedan. I remember watching a documtery on the Mclaren F1 and seeing a guy driving himself, his wife and their son in the car and figured why can't I do the same?. It would be awesome!. I've considered using a 4th generation camaro as a base for the mclaren f1 since they both share identical body lines and if you switch up on a few things you might get away with using it as a donor car. But that center seating positioning and midengined setup will be very expensive to excute properly. I'm not looking for a Replica that's exact but exceptable. This one is okay id say with a little bit of work it can be amazing. But at the rate things are going that probably won't happen. I do like Prototype 2's Zonda a lot. If I ever got around to doing one id look into buying an NSX chassis or even doing on an MR2 chassis like Fillup's enzo. I wouldn't do it on a tube chassis cause that would be way to expensive. With very little work done you could even have an LS1 for power!. Looks like the cars up for sale, 50k Euro.